In a scarce world, society is increasingly interested in the efficiency of resource use; how to get more from less. Yet if you ‘save’ a resource, what does that mean and who gets the ‘saved’ resource? In other words who gets the gain of an efficiency gain? The question over who gets the gain from an efficiency gain was recently writ large by the US Supreme Court decision regarding Montana vs Wyoming. The Court backed Wyoming’s defence that their prior appropriation water law enabled them to use the water freed up by introducing and expanding consumptive irrigation sprinkler systems. The previously ‘inefficient’ flood technology spilled drainage water that downstream neighbouring Montana had become accustomed to. Australia takes a different approach to this question dividing efficiency gains fifty-fifty between the irrigator and river. I consider the competition over future resources ‘freed up’ by efficiency gains in the Earthscan book on the ‘paracommons’. The prefix ‘para’ indicates that the paracommons sits alongside ‘the commons’ (e.g. fish/fisheries in seas, trees in a forest). The paracommons conceives that there are four parties or destinations competing over efficiency gains; the proprietor making the efficiency gain (e.g. an irrigation scheme); immediately connected neighbours (e.g. farmers or villagers using drainage water from the irrigation scheme); the common pool (the river system) and the wider economy (other users such as towns and industry). ‘Para’ also hints at the efficiency paradoxes involved if policy-makers assume, but subsequently fail to account for, how ‘losses’ are delivered to one or more of these four destinations. In the diagram below, the paracommons is exemplified by the passage of a to-be-more-conserved apple-core through the household to four destinations including the household. In the top of the diagram the apple core is discarded by the proprietor household and ordinarily goes to the city garbage where it might be picked over by people whose lives depended on households throwing away food and goods. For both the apple on a kitchen table and the apple core in the city dump there are two commons. The household members compete over the apple and the city dump ‘harvesters’ compete over who eats the apple core. However between these two positions are options that might or might not transpire. The household deciding to eat more food (case B in Figure 4) or recycle the apple in garden compost (case C) deprives the waste pickers at the garbage dump of their sustenance. The waste picker fears the outcomes of a household drive to be more efficient and ‘green’. Alternatively, a waste furnace needs waste to generate electricity depriving the householder, the waste picker and the compost of ‘their’ core. Competition over the core takes place between four types of groups; householder, garbage picker, furnace operator, and those who speak on behalf of apple tree populations. In the paracommons, these four parties are termed ‘destinations’. 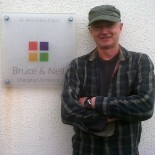 In the same order they are: the proprietor, the neighbour, the common pool (or environment) and the wider economy. 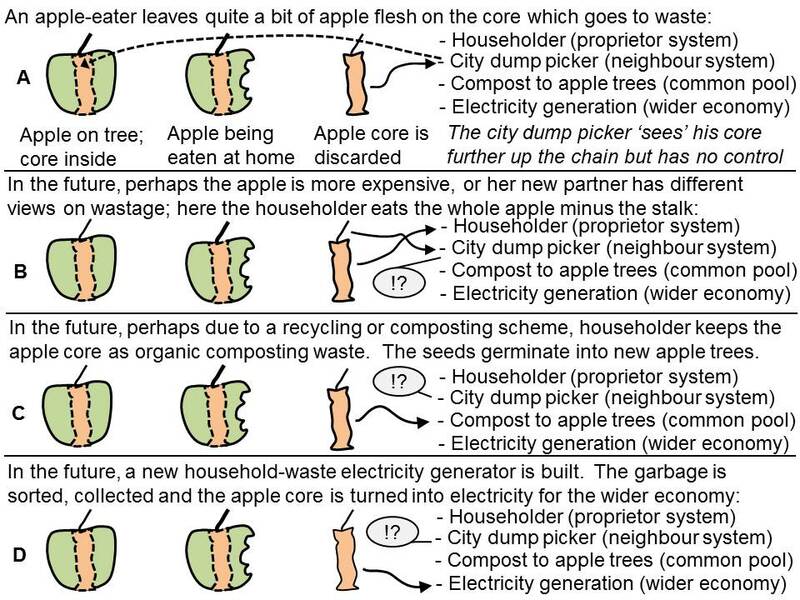 The destination of the core depends on switches and changes in interests and technology affecting the sequencing and cascading of the apple core through the household then onto the compost, city dump or furnace. These four destinations cannot easily communicate with each other over who gets the core as do commons harvesters inside the house and at the city dump. The common pool nature of the core is related to perceptions about today’s waste alongside ‘savings’ to be made in the future. There are both spatial and temporal transitions involved. It is my view that these transitions and associated expectations establish the feature of liminality associated with the paracommons. With the household apple, one observes a physical transition of the apple from one location to another, but critically it is the uncertain futures that determine liminality. One compares the reactions of the city dump recycler between her witnessing simply a longer delay (“the discarded apple will now take four hours instead of two hours to make it to the garbage dump”) with a new waste policy (“all householders are to throw away less food or to recycle more food waste at home”). The latter is accompanied by much higher levels of uncertainty. So while there is always one apple, the insertion of an efficiency drive at the household gives the city dump recycler greater concern regarding what is about or not about to transpire. While the apple remains physically one thing, there are now at least two expectations for the apple; the housekeeper responding to new instructions about waste and the waste picker concerned that less food will arrive at the dump. Previously the unvalued apple core formed only one expectation (or no part of any expectation) as it simply wended its way from the house to the dump as it had many times previously. There is also a proprietor expectation regarding the apple core; the householder naturally expects to have and consume an apple comprising flesh and core. The proprietor’s expectation arises because the apple core forms a commonplace part of the surrounding flesh – it supports the apple flesh (without specialist vacuum wrapping, apple flesh without a core would rot more quickly) and secondly for some (more efficient) apple eaters; the core is edible – it is the apple). Crucially, the apple core and apple are not separated from each other prior to entering the proprietor system and then discretely sent to each destination. On the contrary, the fate of the apple core is mediated by the proprietor and any matters that influence the proprietor. This dimension of ‘expectations’ surrounding multiple possible realities arising from resources transiting systems undergoing efficiency changes is the salient feature of the paracommons. The transiting apple core, potentially shifting in space, use and amount, is the liminal object at work here – it is part of and creates these competing expectations held by users in different destinations. So while there is only one apple core, it arises in the minds of all four users, until it is completely disposed of (composted, incinerated or eaten by householder or dump picker). Between arriving at the proprietor’s house and final disposition, the ‘to-be-wasted/to-be-salvaged’ apple core is, from the combined perspective of the four destinations/users, betwixt and between. The potential parallel fates of the apple core create this particular liminal paracommons. Download the Earthscan flyer here.